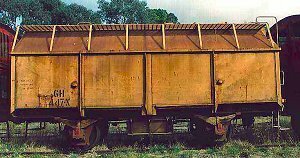 380 of these metal 14 ton capacity steel box wagons (Nos 1 - 380) were built at the Bendigo North Workshops between 1958 and 1961. Obtained from Mildura where it had been used as car cleaners' store. The 'HY's' were grain-proofed and recoded 'GY' during the 1960's. Reclassed 'G' during the 1970's if unsuitable for bulk grain use. One of 750 GY trucks built by Metro Cammel C. & W. Co., England, between 1951 and 1953. One of 1020 GY trucks built by A.E. Goodwin, N.S.W., between 1950 and 1954. One of 500 GY trucks built by Pressed Steel Co., England, 1951- 52. Built as HY at Newport Workshops 1948 - 50. One of 750 GY trucks built by Birmingham Railway Car & Wagon Co., England, between 1950 and 1954. One of 750 GY trucks built by Metro Cammel C. & W. Co.,	England, between 1951 and 1953. 1948-50 Built as HY at Newport Workshops. A programme of converting GY trucks to bulk grain hopper units commenced in 1979. 1949 Built at Newport Workshops as HY 16134. 1962 Grain-proofed for transport of bulk grain and recoded GY 16134. Both units in the collection were in a group of 10 casualty trucks built at Newport Workshops 1900-01. Built with Westinghouse air brake fitted. 1900 Built at Newport Workshops. 1933 Modified with transition hook. **** Breakdown van at Hamilton. 1956 Modified for autocoupling - transition with buffers. **** Breakdown van at Echuca. 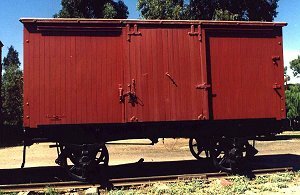 Converted from vehicles no longer required for revenue service, such as H box vans, U louvre vans and I and IA open wagons, for use by the Victorian Railways for departmental purposes. Built at Newport Workshops as I open wagon. 1935 top operated Alliance Automatic couplers fitted. 1957 converted - reclassified HD 38. See entry for U 102. Built at the Newport Workshops a U 321 an 18' steel louvre van. 1931 Modified with top operated Alliance automatic couplers. 1974 Converted to HD 106 at the North Melbourne Workshops. 1916 Built at Newport Workshops as I 14813 open wagon. 1933 Modified for automatic coupling. 1961 Converted to HD 193 at Ballarat Workshops, (raised sides, modified doors, roof added). NB - fitted with buffers and transition couplers. 1933 Modified with top operated Alliance automatic coupling, converted to 4 wheel. Vehicles converted for the transport of wheel sets, etc. between workshops. 1919 Built as 6 wheel metal louvre van U 989. **** Modified for use by Rolling Stock Branch as Motor Bogie Transport vehicle and reclassified HR78. The "I" wagons first entered service on the Victorian Railways in 1908. Over eight thousand of these general-purpose vehicles were built. 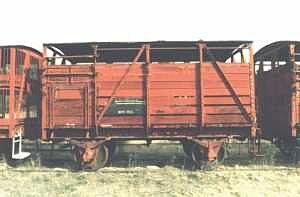 Following the introduction of the "GY" and "HY" units many "I" trucks were converted to specialist usage wagons. By 1982 all "I" wagons had been removed from revenue service. Originally coded ' X' class, twenty (Nos 8 - 27) of these 640 cu. 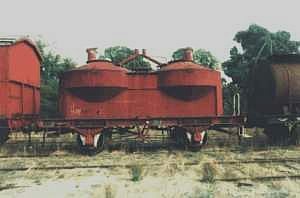 ft capacity air discharge bulk cement hoppers were built at Newport and Ballarat Workshops 1959 - 60. Reclassed 'J' in 1963. 50 similar units (Nos 28-77) with 810 cu. ft capacity were built at Newport & Ballarat during 1960. 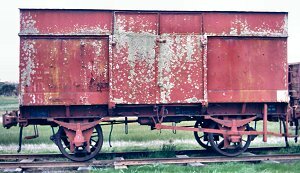 Twenty-five of these cattle wagons were built at Newport Workshops in 1928, classed MM. Capacity for 18 beasts. 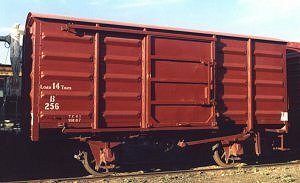 Between 1965 and 1973 the wagons were fitted with roller bearing bogies for use on fast freight trains. 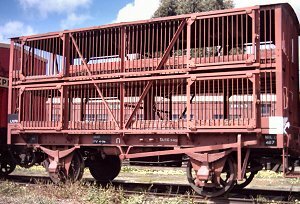 Believed to be the only example of Victorian Railways bogie cattle truck remaining.